Our last post mentioned, “roll out of 4G LTE and imminent data price wars” in anticipation of the Reliance Jio launch. And, a couple of days before we posted the infographic, Jio opened up their ‘freedom offer’, which was restricted earlier, to everyone ; it’s now probably becoming the ‘welcome offer’. My interest in Jio was piqued the moment I saw tweets with screenshots, especially this one, of the data plan from ANI_News, which was live tweeting the AGM. The reason was my current mobile plan. I use a Rs. 1,299* plan that my current mobile operator offers (with a discount of Rs.783, they call it a 3G promo offer) for which I get, “299 minutes of free talk time”, “200 free local sms” and “1GB data” on their 3G network. My primary reason for choosing this plan was the data pack. I calculated that I needed about 1 GB of mobile data for on-the-go occasions and for everything else, there was my unlimited home wi-fi of which I consume about 6-8 GB of data on my phone every month. Now, with the Rs.499-M plan of Jio, which is less than half of my current mobile plan, I can get 4x (and more) the data at 10x speeds. What’s more, I can do away with my home wi-fi connection! The only thing that stopped me from going in for a Jio connection earlier was that my mobile phone (Oneplus One, running CyanogenMod) wasn’t a device originally listed in their device FAQ. The moment the phone compatibility issue was taken care of with the Jio4g voice app, I was in the queue for a Jio SIM. The Aadhaar card based activation was a breeze and I had the Jio SIM about 30 minutes later – most of which were spent standing in the queue. Barring the face-to-face interaction with the Jio representative at the store, experience with Jio at other touchpoints hasn’t been satisfactory. I couldn’t get through to the Jio tollfree number easily to enquire about the compatibility of my phone on their network. When I did, I had to wait about 20 minutes and then talk to an untrained customer care associate who asked me what the, “brand name and model was for a Oneplus One” (even the rep at the store wasn’t that clear, all he said was, “if you’ve got an offer code on MyJio app, the phone works”). Activation took about 3 days since the day I got the SIM, and I got to know about it only after another call to the tollfree number because the activation SMS didn’t reach me. Having used the Jio network for almost a day now, the overall usage experience is nothing great to write home about. I couldn’t place any outgoing calls to numbers on other networks barring Jio ones and an MTNL landline. Calls from other networks, including MTNL, to a Jio number don’t go. While I could receive SMSes on the Jio number, the ones I sent out weren’t received on numbers on other networks. The much touted 4G data speed too wasn’t in sight. I was getting download speeds ranging between 60-500 kbps. There are also other minor niggles in the app which will hopefully be ironed out soon – the Jio4gvoice app is always on, draining the battery more than necessary and I found the 4g connection drops when I am on a wi-fi network. I suspect, this is also probably forcing customers that are unwilling to let go of a number they’ve had for ages, to use Jio as a second network more for data than voice (and they have an “activate data only” option as well). The other thing which I suspect is going to happen is that while Reliance Jio has full visibility of which networks people are coming from or going to switch from (thanks to the data they are collecting during the signup), the telecom operators are in the blind as to how many of their existing users are trying out Jio. Come 1st January, the blindsided operators, might lose millions of subscribers at one go. This is just a hypothesis based on observations of those in queues at a few Jio stores. If the free voice calls and free SMS lures enough of those using features phones on pre-paid cards towards smartphones, and if they experiment with downloading music and video and are satisfied with the experience, and if a sufficient number continue on the Jio network after Jan 1st, then smartphone usage would have penetrated a whole new segment. Three big Ifs, I recognise, but the combination has the potential to be a game-changer. Of course, a large chunk of these users may turn out to be shrewder / more value-conscious than we give them credit for and may stop consuming data for entertainment once they have to pay for it. They might yet continue with Jio for voice calls, in which case though Jio would have succeeded in switching users from competing networks, the task of changing their usage behaviour and increasing ARPUs would still remain. Worst case, if the voice connectivity on Jio networks is poor (as it is currently) , they may switch back to their old networks and it’ll be a bet gone horribly wrong – the mother of all promotional offers, one that induced a lot of free trial, but generated little conversion or loyalty. Even before Jio gives out the SIM, they have access to pretty much everything on a prospect’s phone – read and modify contacts, call log, calendar, sms, location – via this placeholder of an app called MyJio. Add Jio4gvioce, they can have everything else from your phone – identity (personal and device), camera, media (photos and everything else on your phone and sd card), microphone. Not many users in India are educated or knowledgeable about how much data an app can access and transmit. Price wars are imminent: Airtel has already cut prices. BSNL announced that it will match Reliance “tariff-by-tariff”. Vodafone and Idea are yet to announce their plans. 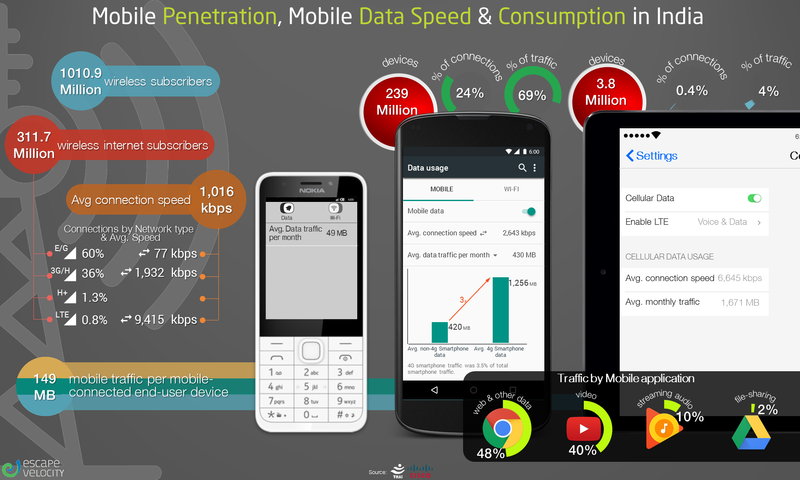 Mobile data consumption is set to explode: In the previous post, we mentioned that there are, “33.9 Million mobile users (~11% of total mobile internet users) who consume over 2 gigabytes of data per month”. Now, Reliance Jio claims, ‘the average monthly data consumption per user has exceeded 26 GB’ in April-June quarter and they had, ‘over 1.5 million test users’ even before the test launch. That’s a 13x jump in average data consumption by a smart phone user! That might be the best case of course, but considering that one gets 4GB of daytime data and unlimited night time data over mobile networks and 8 GB over Jio public wi-fi hotspots, even in the Rs. 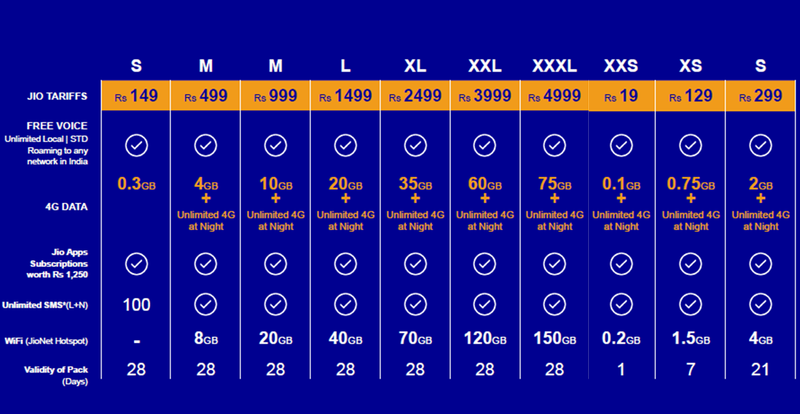 299 (pre-paid) and Rs.499 (post-paid) plans, these averages aren’t going to hold for long. This might be the stimulus the telecom industry needs during a time when the average data ARPUs are falling ( as data prices have largely remained constant while average ARPUs have been falling, my hypothesis is that new users being added aren’t consuming as much data). Collateral damage – voice calls: There has been much acrimony already between Reliance and other operators. 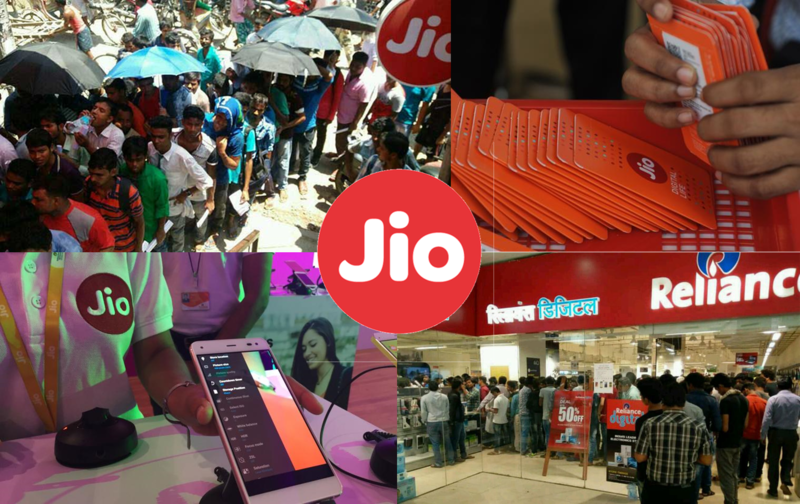 Reliance Jio has accused incumbent players like Bharti Airtel and Vodafone of not releasing sufficient inter-connection ports to terminate a voice call in another network (news report 1, 2). I think it’s a moot point because, eventually, people using Reliance Jio (or other networks matching Jio’s data prices) are going to be doing a lot more of VoIP and video calls. Operators are not going to choke on incoming voice as they are currently claiming, they are going to choke on incoming data. Collateral damage – entertainment apps: The SOP 5 with the Jio SIM is, “Install Jio Apps” and the MyJio app installs a Chat, Cinema, TV, Music, Magazine, News, Storage/Drive, Money, Fashion app. My hypothesis is all the lesser used or upcoming or limited content or me-too apps in these domains are going to really find it difficult to survive. I also think DTH operators are going to suffer a bit. I definitely don’t find it worthwhile to pay for a big bundled pack every month when I view only 1-2 hours of TV a week. If I can access those few shows online, I am definitely going to cast them on my TV and disconnect my DTH. Data services as the imagery drivers: We also mentioned, “Indians are still more concerned about voice quality than data services” and that, “among smart phone users elsewhere, data speed is considered to be the most important factor in determining both network performance and satisfaction with an operator”. India is going to catch-up to this paradigm soon. The provider who has better data network and app content is eventually going to win and Reliance Jio has already built a huge lead in it. The last time, Reliance launched a mobile network, it brought the voice prices down. Hope they do it for data now. All in all, exciting times ahead both for users and watchers.